Printing is 12 cents a page. Color printing is 25 cents a page. Ask at the front desk. DVD players are in the computers. Check out headphones at the circulation desk. Study Rooms – Group study rooms and the silent study are closed for fall semester 2018 due to construction repairs, but you may use the library classroom for group study. You can have DVDs, videos and books sent to Cañada College from any of the 32 public libraries in San Mateo County. Librarians are available to help you any time the library is open. Black & white photocopier. Print for 12 cents a page. Course Reserves: Textbooks for many classes are available to check out of the library for short periods of time like two hours, one day, three days or one week. Ask at the circulation desk. Usually only for using in the library for 2 hours. Computers do not require a log in or have a time limit. Copiers and printers: The cost is 12 cents a page to print and to copy using a print card. A print card costs 50 cents. 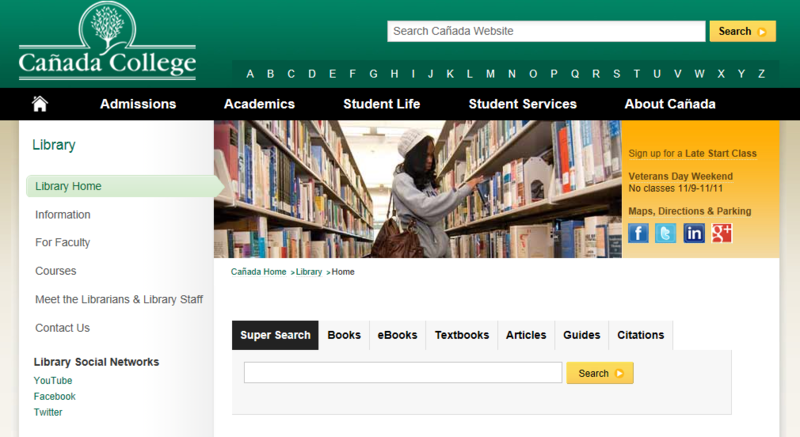 With a library card you can place holds on books, CDs, DVDs and more and pick them up at Cañada College Library.